Both sail and powerboats have used bimini tops for years to protect passengers and the vessel itself from the elements (mostly the sun) and to create shade while retaining visibility from the helm and allow air circulation. Biminis enhance a boat’s profile and appearance and come in a range of models, sizes, and colors for any boat size and style. A bimini is a free standing, waterproof, open-front cover that protects a powerboat cockpit or other area from the sun, offering minimal protection from wind, rain, or spray when moving forward. Some biminis are designed with side panels, attached to the top with snaps or zippers and called a fully-enclosed bimini. Most biminis are supported by aluminum stanchions (called “bows” in the bimini world, not to be confused with the front end of the boat). Nylon, aluminum, or steel mounts and strapping keep the top secure and the fabric taut and allow for folding when not in use. More expensive models use stainless steel bows and fittings, providing increased durability, especially in saltwater environments. A do-it-yourself bimini installation is a great way to save money, and is relatively easy to tackle. However, because there are many issues to consider, including safety, visibility, aerodynamics, structure configuration, and gunwale openings, many owners use professionals to install the bimini. The information below about the safety and care of biminis can help boat owners plan an installation, whether as a DIY project or using professionals. Bimini tops are available in two-, three-, and four-bow configurations, described below. Two-bow — for shorter V-hull and jon boats, providing inexpensive and lightweight protection. Three-bow — for medium-length tournament ski, V-hull, center console, cuddy cabin, or open deck boats. Four-bow — for longer center console, cabin, or pontoon boats. At eight feet or more in length, four-bows are recommended for longer vessels. Accurate width, length, and height measurements are important for bimini installation, described briefly below. Width — Bimini frame width is determined by measuring between the points where the two mounts attach to the gunwales. This measurement is the most crucial for bimini installation and is not the same as the boat’s "beam" (the outside width between gunwales). Off-the-shelf widths are available in six-inch ranges. Frames can flex up to three inches. Length — Bimini length is determined by how much of the boat will be covered fore and aft of the mounting point. For example, a six-foot bimini covers three feet in front and three feet behind the mounts. Off-the-shelf lengths range from three to 10 feet; six-foot tops are the most popular for runabouts. An eight- to 10-foot bimini is typically used on pontoon boats. Height — A bimini with more height provides more headroom on boats with low gunwales, while a shorter top provides a sleeker look and works well on boats with high gunwales. For example, a center console boat typically uses a taller top, while a ski boat may have a shorter bimini because most ski boats are operated while seated. For accurate height measurement, stand inside the boat and measure the vertical distance from mounting points upward to determine how much headroom will be available. Fabrics — The best bimini fabric is suited for the weather it will face. Fabrics come in a range of materials, such as canvas, mixed blends, vinyl, polyester, and acrylic. The material should be tough, water repellent, able to withstand ultraviolet rays, and be double-stitched for strength. Over time, sun exposure diminishes bimini fabric water repellency and ultraviolet protection qualities, so a solution to bolster water repellency and UV protection should be applied at least once a year. A storage boot that withstands extended exposure to the elements is also important. For humid and hot climates, the best fabric is one that breathes well and has high mildew resistance and UV protection ratings. In northern climates where snow or ice can accumulate on biminis, select a fabric that has a high water repellency rating. Select a material color that coordinates with boat hull or superstructure colors. The best hardware for mounting bows and fore/aft strapping hooks to gunwales is stainless steel, which resists corrosion and provides years of low maintenance. Fixture screws should also be stainless steel to resist corrosion. For added strength, the screws can be “through-bolted,” penetrating the entire thickness of the gunwale. Also, a “backer plate” between the underside of the gunwales and screw bolts distributes the bimini weight along the gunwale. Nylon fixtures and fittings are less expensive, but over time can become brittle and susceptible to breaking. Bimini are popular shade makers on all kinds of sailboats, particularly on cruising boats and in most configurations, protect the aft portion of the boat. Some sailboats utilize an awning for shade, which uses the mainsail boom (with a furled mainsail) to support the fabric. To protect helmsmen and passengers from harsh weather and seas, sailboats also use a waterproof dodger (sometimes called a spray-hood) that covers the sailboat cockpit and companionway. Usually made with clear vinyl windows with fixed supports, a dodger shelters passengers from sea spray, rain, snow, and wind coming from forward. On sailboats with biminis or awnings, sailors should be mindful that whatever the configuration and whether stowed or deployed, biminis and awnings must be positioned to allow uninterrupted visibility and easy access to running lines and the helm, vitally important concerns on sailboats. Biminis can adversely affect boat operation and safety. Consider these tips while underway, at the dock, or trailering. Test how the bimini performs at various boat speeds. If excessive fluttering or shaking occurs at higher speeds, check deck fittings and fabric connections and adjust as needed. Determine the maximum speed at which the bimini becomes unstable and operate at or below that speed. In high winds, ensure that the top can withstand the extra force; if not, stow it. In some conditions, the combination of wind direction/strength, boat position/weight, bimini size, and other factors can affect boat handling. The top can act like a kite, creating a potentially unsafe situation. 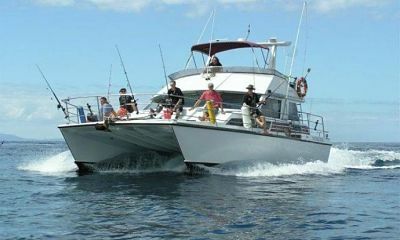 Bimini bows, frames, fittings, and the boat itself can sustain damage if the vessel is being towed or towing another vessel. Make certain that towing lines are clear of bimini hardware and do not chafe the fabric. Whether stowed or deployed, ensure that the bimini position allows 360-degree visibility from the helm. Unobstructed vision forward, to the stern, and to port/starboard is vital to safe operation. Before installing a bimini, check the location of running navigation lights. Whether stowed or deployed, the bimini itself, frames, and mounting hardware must not obscure these lights. If trailering a boat with a bimini, make sure the frames are secured and affix the storage boot to protect the top from catching wind before getting on the road. Protect a bimini top by following these care tips. Regularly check all deck fittings for tightness and tighten as needed. Ensure that hold-down straps are snug. There should be little or no slack in the hold-down straps when attached to the gunwales. When trailering, fold the bimini to its lowest profile and stow in the storage boot. To keep the fabric looking its best, regularly remove loose dirt and accumulated water, ice, snow, or leaves. To clean, use a solution of lukewarm water and mild soap, rinse thoroughly. and air dry. Never machine wash, dry clean, or iron bimini fabric. A marine grade fabric and/or vinyl cleaner will help to remove dirt and stains. After a voyage, allow the fabric to thoroughly dry before folding or placing the storage boot over the top. Biminis enhance a boat’s profile and appearance, add color to the boat, and provide relieving shade and some protection from the elements. 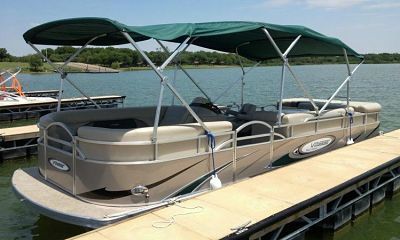 Whether installing a bimini as a DIY project or having someone else do the work, enjoy the shade!